There is a new post over at Raven Boy Music today about some of the songs from A Turning of Seasons, Lisa’s album of songs for each season of the year. The main song for this week has to be Harvest, which is the song she wrote when she realized she wasn’t really wild about any of the traditional John Barleycorn themed songs. Since then, Harvest has become one of the “hits” from the album. This is the long-awaited Christmas album by Ken and Lisa Theriot. It is the first Raven Boy Music release by both Ken Theriot AND Lisa Theriot together. In the beginning (ca. 1988) their different song selections and writing styles were different enough that separate “solo” albums made sense. Then they just kept doing it that way. But since The Gifts of Midwinter is a collection of holiday songs, it seemed a good time to to put out a “Ken and Lisa Theriot” album. Speaking of the songs, here is how the album is described on CD Baby: Songs you don’t hear on every Christmas album, a mix of songs from the secular to the sacred, the medieval to the modern. Two original songs, one cover, and everything else is traditional. The goal from the beginning was to create an album that wasn’t just a rehash of all the same Christmas songs you hear everyone doing. We think we succeeded in that. You can get the physical CD (as well as the digital album and song downloads) at CD Baby here: The Gifts of Midwinter. That’s also where you can download songs or the whole album from iTunes here: Ken and Lisa Theriot. BTW, since you cannot get the liner notes anywhere but here (limitations with the manufacturing process we use), we offer them free as a pdf download here: The Gifts of Midwinter liner notes. The Christmas Album Almost Done! Putting the last song in the can today! 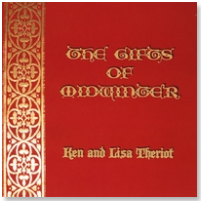 The Ken and Lisa Theriot Xmas album,”The Gifts of Midwinter,” is nearly here! Watch this space.